According to ChemOrbis, the downward trend has gained speed across the European PS markets where prices are seen posting three-digit decreases for another month, weighed down by bearish upstream costs. 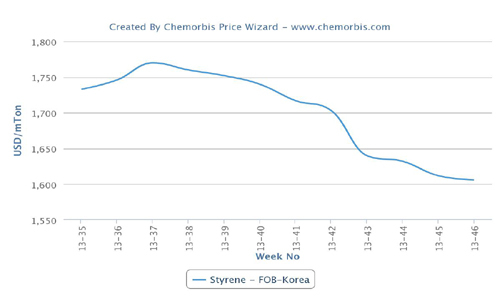 Styrene contracts settled with sharp decreases of €290/ton from December due to plunging crude prices and butadiene contracts also settled down €100/ton for January. Following the monomer settlements, the impact of the bearish energy markets continued to be felt on spot styrene prices as Brent crude futures dropped below $50/barrel during intraday trading on January 12. 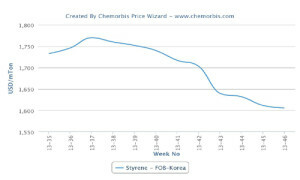 Spot styrene prices on an FOB NWE basis slumped by $140/ton on the week and broke below the $800/ton threshold on January 9. As a result, PS buyers are taking a waiting stance for now thinking that further decreases are likely even though prices have posted even sharper decreases compared to December. Initial spot prices for West European PS emerged with larger decreases of €200/ton from December in Italy. A distributor commented, “We are not receiving price inquiries these days as buyers are taking a waiting stance due to rumors of further reductions in February.” Indeed, buyers are not rushing to make new purchases despite the three digit drops, thinking that the PS market still has room to move lower.